ALBANY, New York, June 19, 2012 (ENS) – The Albany County State Supreme Court has dismissed a lawsuit that attempted to block New York State’s participation in a multi-state effort to reduce greenhouse gas emissions. New York Attorney General Eric Schneiderman defended the state’s participation in the Regional Greenhouse Gas Initiative, RGGI, against a lawsuit backed by the out-of-state Republican organization Americans for Prosperity that sought to force New York to withdraw from the Initiative. “This is a significant victory for those of us who take the threat of climate change seriously, and want to mitigate its harmful effects,” said Schneiderman. “RGGI offers a cost-effective, efficient way to reduce the pollution that contributes to climate change. I applaud the court for soundly rejecting this attempt – backed by out-of-state political interests – to stop New York from protecting its own citizens against the potentially devastating impacts of climate change,” he said on June 13, when the court handed down its ruling. RGGI is the first market-based regulatory program in the United States to reduce greenhouse gas emissions. Nine Northeastern and Mid-Atlantic states – Connecticut, Delaware, Maine, Maryland, Massachusetts, New Hampshire, New York, Rhode Island, and Vermont – together have capped emissions of carbon dioxide, CO2. Their goal is to reduce CO2 emissions from the power sector 10 percent by 2018. In 2005, the states signed their RGGI memorandum of understanding in which each agreed to propose a program to regulate carbon dioxide emissions from fossil fuel-fired power plants. After a three-year process, in 2008, the State of New York adopted regulations implementing a CO2 cap-and-trade program in New York. Schneiderman recognizes that fossil fuel fired power plants are major contributors to climate change. 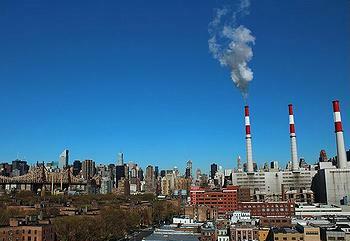 In New York, they emit roughly one-fifth of all the CO2 generated in the state. Under New York’s RGGI regulations, emissions of CO2 by power plants of 25 megawatts and larger operating in the state are capped. Power companies must obtain CO2 allowances sufficient to cover their plants’ emissions. Most buy their allowances through public auctions held by the state. Companies that reduce their emissions do not need to purchase as many allowances, or they may sell unneeded allowances to other power companies. Proceeds from the auctions support renewable energy, energy efficiency, and other greenhouse gas reduction and climate protection efforts. A recent study conducted by the independent economic consulting firm Analysis Group concluded that RGGI has added $1.6 billion to the economies, and 16,000 new jobs, in the participating states. The study projected that RGGI will provide consumers in these states with $1.3 billion in savings on their electric bills over the next decade through energy efficiency measures using funds generated by the Initiative. In his motion to dismiss the legal challenge, Attorney General Schneiderman argued that Americans for Prosperity lacked a legally-protected interest sufficient to challenge the RGGI regulations, and that their lawsuit was barred by their unreasonable delay pursuing the challenge. The plaintiffs filed their lawsuit in June 2011, three years after New York began implementing the Initiative. The court, in dismissing the lawsuit, agreed with the attorney general on these arguments. The Adirondack Council has participated in the RGGI’s quarterly carbon allowance auctions since they began in September 2008. The organization has purchased 14,000 tons worth with money donated by its supporters and retires them by withholding them permanently from the market. The RGGI cap-and-trade system is working well according to the program’s first three-year Compliance Summary Report, issued June 4. The report shows that 206 of the 211 power plants governed by the program met their compliance obligations. The first three-year control period ran from January 1, 2009 to December 31, 2011. Average annual CO2 emissions for the three-year period were 126 million short tons, a 23 percent reduction when compared to the preceding three-year period, 2006-2008. Three-year average electricity consumption across the region declined moderately, by 2.4 percent, in the same period, according to the U.S. Energy Information Administration. CO2 emissions were collectively reduced to 33 percent below the annual pollution cap of 188 million short tons. “The RGGI region leads the nation in reducing power-sector CO2 pollution,” said Collin O’Mara, secretary of the Delaware Department of Natural Resources and Environmental Control who chairs RGGI, Inc.